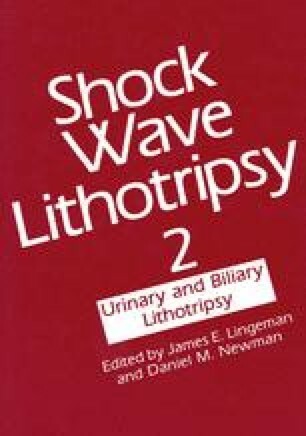 Peripheral blood mononuclear cells (PBMN) from healthy donors and urolithiasis patients before and after extracorporeal shock wave lithotripsy (ESWL*) or transurethral ureterolithotripsy (TUL) were harvested using Ficoll-Paque gradient in order to study the effects of shock waves on PBMN. In vitro studies showed that deoxyribonucleic acid (DNA) synthetic activity of PBMN from healthy donors was severely suppressed after exposure to 50 shock waves (SW). NK cell activity was also suppressed after 100 SW, although these cells were still alive as determined by the trypan blue exclusion test. After TUL, the number of lymphocytes was significantly decreased, but DNA synthetic activity and NK cell activity of PBMN were not significantly changed. On the other hand, after ESWL the number of lymphocytes and their subpopulations (OKT 4 or OKT 8 positive lymphocytes) was not changed. However, the responsiveness of PBMN to phytohemagglutinin (PHA) was significantly decreased for patients with kidney stones after more than 1,200 SW, and it recovered to a normal level four days after ESWL.